Search by name, suburb, postcode, specialisation. How Do I Find An Accompanist? On this website you will find listings for all our Guild members, which you can search by suburb. 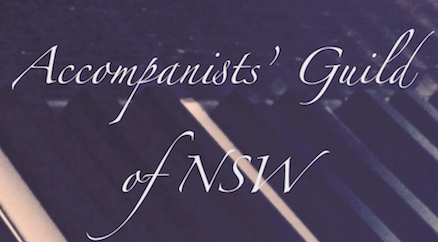 Although they are by no means the only accompanists in Sydney, you can be assured that Guild members are all highly skilled individuals who must meet professional standards set by the Guild in order to be accepted as members. What Do I Say When I Contact An Accompanist? If it is an exam, you should give the date, time and place of the exam, as well as the instrument and grade. The more information you provide with your initial contact, the easier it will be for the accompanist to respond with their availability. Each accompanist, as in any profession, is entitled to set their own fees and conditions. As a guide only, it is reasonable to expect to pay upwards of $90 per hour for rehearsal time plus a fee for the exam or performance. The number and length of rehearsals will depend on individual circumstances, including how prepared the student is, what level they are, how many pieces need to be rehearsed and their level of difficulty, and how quickly the student becomes comfortable playing with the piano. This cannot always be determined before the first rehearsal. Attendance to play for your performance, whether it is an exam, audition, concert, or recording is often priced separately from the hourly rate, depending on various factors such as level of exam, and if your exam is the only one the accompanist is attending on that day. However, sometimes an accompanist may quote a single fee that includes, for example, two rehearsals and the performance. Make sure you understand and accept the accompanist’s rates before engaging them. How Do I Prepare For The First Rehearsal? Glad you asked! Make sure you have a copy of the piano parts for ALL your pieces, including extra lists (if you’re doing an exam). If they are photocopies, make sure they are clear, that none of the music is missing from any of the pages, and the pages are in correct order, preferably in a folder so the accompanist can turn the pages while playing. Bring these to your first rehearsal, unless the accompanist has requested them ahead of time. N.B. Please ensure if using photocopies, that they comply with AMEB and copyright laws (read more). Please arrive on time for your rehearsals, just as you would for your instrument/voice lessons. Your accompanist may have other students on either side of your rehearsal, and only able to give you the time allocated. Why Do I Need An Experienced Pianist? When you are performing under pressure, such as in an exam, concert or audition, you want to feel secure that you have a reliable pianist supporting you. This allows you to present yourself at your best and not be worrying that your pianist is not up to the task. While a pianist¹s job is not to disguise your lack of preparation, an experienced pianist can certainly minimise the damage that mistakes and nerves can cause during performance. During rehearsals, a good pianist will be able to assess your strengths and weaknesses and be able to anticipate where things might go amiss during the performance. An experienced pianist will not collapse under pressure, and will support you during the performance, helping to keep you steady and in control. Musical performance is a team effort. Good preparation together is essential so you are familiar with what is happening in the piano part and how it fits with your part so there are no surprises in the exam or performance. The amount of time you need with your pianist depends on how quickly you adapt to playing with the piano and what your teacher thinks you need to feel confident. If you are rehearsing without your teacher, you can usually pick up valuable information from your pianist if they have lots of experience. The level of difficulty of the piano part sometimes bears no resemblance to that of your instrument or voice. You might have a simple part while the pianist is playing handfuls of notes for every one that you play! If the pianist has a difficult part, they are not charging you extra for the time they are practising on their own. The pianist will always let you know their fee before they accept the job. What you are getting in return is their time and experience, which is often many years and at an international level.